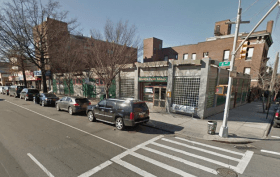 In 2014 the news surfaced that Brooklyn Public Library (BPL) was planning to sell its Sunset Park branch at 5108 4th Avenue to a non-profit community development organization, Fifth Avenue Committee (FAC). The developer would demolish the 43-year-old building and build in its place a larger library with eight stories above that would contain 49 below-market-rate apartments, in part with public money allocated by Borough President Eric L. Adams. The developers say the plan will create housing for Brooklyn’s neediest residents. Brooklyn Paper now reports that developers are preparing to pitch the project to Community Board 7’s land-use committee on November 3 as part of a public review process. The city council has the final say whether it goes through.